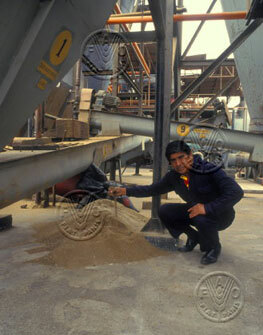 Fishmeal prices remain strong in the first quarter of 2013 as the 2012 supply fell below production levels achieved in 2011. Coupled with strong demand from aquaculture producers, especially supplying Asian markets, fishmeal prices reached levels not seen since the first quarter of 2010. In related markets, soymeal prices fell slightly in the first quarter of 2013 compared with prices achieved in mid 2012; however they remain relatively strong because of global demand for animal feeds. In the last quarter of 2011 good catches in South America pushed fishmeal production levels up to a total of 2.6 million tonnes for the whole of 2011, which led to a decline in fishmeal prices in the last half of 2011. However, in 2012, catches in the last quarter of the year were considerably down on the previous year in the Pacific Ocean, as a result of adverse climatic conditions, giving a lower total production of just 1.7 million tonnes of fishmeal for 2012. In 2012, Icelandic production rose significantly, thanks to rising catches of herring and mackerel, while production by Denmark and Norway declined. Total fishmeal production declined 35% between 2011 and 2012. As anticipated, Latin American production in 2012 was below 2011 levels because of the effects of the El Niño phenomenon. Latin American exports of fishmeal were dominated by Peru, supplying 82% of the 1.6 million tonnes. The majority of Peruvian fishmeal was absorbed by China (52%), followed by Germany (15%) and Japan (9%). The primary export markets for Chilean fishmeal in 2012 were also China and Japan, taking 54%. Import statistics reveal the top three importers, Germany, UK and USA, absorbed a combined total of 145 700 tonnes of fishmeal in 2012. However, this excludes China, which is the largest importer overall. Germany accounted for 66% of this share, importing primarily from Peru, Morocco and Chile. The UK absorbed 21% of this trade, mostly from Peru and other European countries, including re-exports from Germany. USA fishmeal import demand grew 26% from 2011 levels and was satisfied primarily by Chile and Mexico. EU Imports from outside the EU were 63% of total EU imports in 2012, compared with 57% in 2011. Both the share of extra-EU imports and the total volume increased between 2011 and 2012. The top three suppliers of extra-EU imports were Peru, Chile, and Iceland in 2012, compared with Peru, Chile and Morocco in 2011. Pressure on fishmeal prices in 2012 remained strong as a result of Latin American supply constraints in an El Niño year coupled with strong demand in Europe and Asia. The average fishmeal price in the third quarter of 2011 was USD 1 351, compared with an average fishmeal price of USD 1 775 in the third quarter of 2012. Relatively high fishmeal prices the end of 2012 carried over into the first two months of 2013.